This week on Dracula: we learn, once again, that COMMUNICATION IS SUPER IMPORTANT. I don’t know why it’s so difficult. Communication as power is a huge theme in this book, intentionally or not. Keeping people ignorant is a terrible idea especially when there are vampires out to get you – Lucy’s mom agrees with me, I’m sure of it! Like, I understand that Van Helsing is struggling with other people’s inability to believe in blood-sucking monsters, but GOOD. GRIEF. All of the dudes keeping Lucy and her mom in the dark about everything, Van Helsing and Seward trying to keep Arthur in the dark about Lucy, Mina and Jonathan trying to stay in the dark about whatever happened to Jonathan….UGH. JUST. COMPARE NOTES ALREADY. Renfield is the only other dude besides Van Helsing who knows what’s up (“the blood is the life; the blood is the life!” (170) and he’s insane, and as we all know you can’t trust insane people. Right, Seward? “I am beginning to wonder if my long habit of life amongst the insane is beginning to tell upon my own brain” (163). The incredibly detailed interview with the zookeeper is super random, but also, why would you name your gentle loveable captive wolf “Bersicker” (164)? I’m not picking up what you’re putting down, zookeeper. I presume that the wolf that escaped from the zoo is the same wolf that breaks through Lucy’s window and allows Dracula to get in to her. But then Lucy talks about dust floating around in the room and it’s mesmerizing (174), just like Jonathan with the dust that turned into the vamp-ladies, and it seems like if Dracula could shape-shift into dust he could just dust himself through a closed window??? DISCUSS? But to be honest, Lucy’s diary entry at the end of chapter 11 is one of the more terrifying parts of this book for me. It’s so claustrophobic and helpless-feeling: even though she’s in a house (in the middle of town?) with her mom and a bunch of servants they’re all trapped and essentially at Dracula’s mercy. I don’t know, was it scary for anyone else? Or was there another part that was scarier for you? you and your doctor bro are bustling around trying to save this girl you have a huuuuge crush on and you’re like “bro we need more blood” and suddenly you realize your American gunslinging bro has been sitting behind you on the sofa the whole time (179). I don’t have a point to this, I’m just amazing Quincey doesn’t have an attack of the hysterics or something since the girl he likes is dying and stuff. He’s just…sitting there. Creepin. And sometimes when we don’t want them, to be honest. There’s a really good Renfield joke to be made here about how the older generation characters are dropping like flies, but I can’t quite manage it. Seriously, though: Lucy’s mom, Arthur’s dad, Jonathan’s boss, all in a couple of chapters. Van Helsing is lucky his grey hair hasn’t killed him yet. Van Helsing has an attack of the hysterics (208) but in a manly way I guess??? Seward’s comments on that are wild. Apparently you can lecture women right out of their hysterics, but men cling to their hysterics hard. Bizarre Twilight reference, ahoy: “I am daze, I am dazzle” (219). Are you sure Stephenie Meyer didn’t read this before writing Twilight? I have two favorite scenes in these chapters. “I could not resist the temptation of mystifying him a bit—I suppose it is some of the taste of the original apple that remains still in our mouths” (218). That apple was delicious, okay. “Ah, it is the fault of our science that it wants to explain all; and if it explain not, then it says there is nothing to explain” (227). “He meant that we should have an open mind, and not let a little bit of truth check the rush of a big truth, like a small rock does a railway truck. We get the small truth first. Good! We keep him, and we value him; but all the same we must not let him think himself all the truth in the universe” (229). Whew! That’s all I got for this week! Jonathon Harker makes a judgement of Van Helsing’s personality based on his eyebrows and Van Helsing mentions physiognomy. If you’re not familiar with it, it’s basically the study of human faces and how the way you look means you behave or think a certain way. Victorians loved it because it gives your racism some pseudo-scientific backing. Here are a couple of links. 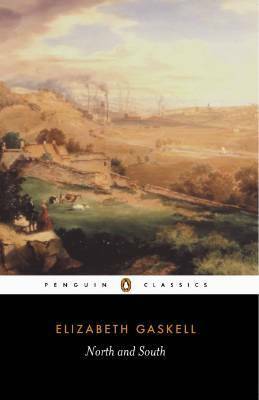 North and South by Elizabeth Gaskell (a contemporary of Charles Dickens) is set in Victorian England, and focuses on the huge changes that industrialization had brought to the country, highlighted by the social clashes between the tradesmen who are becoming rich and powerful, and the “old money” gentility. The story is told through three families, the Thorntons (southern tradesmen, the Hales (northern gentility), and the Higginses (southern working class). Margaret Hale, our bold heroine protagonist, moves to Milton, a northern industrial town, with her father, a dissenting clergyman, and her mother. There, she is initially repulsed by the different way of living all around her, and especially by the owners of the various mills and factories, exemplified by Mr. Thornton. She also befriends the Higginses, who work in the mills and give her first-hand accounts of how horrible it can be to work there. That’s the stage, in a nutshell, but there is a LOT going on in this novel, both on a basic plot level and on a thematic level. The Hales are struggling to adjust to their new life, the Thorntons are struggling with their business and a union strike, the Higginses are involved with the strike, pretty much everyone gets sick at some point, and there’s a mystery involving Margaret’s brother Frederick. There may or may not be a romantic plot as well. ALL of the individuals clash with each other, usually because of misunderstandings because they’re all REALLY defensive toward their own way of life. There are frequent arguments and collisions between the North and South, the rich and poor, the educated and non-educated, and the pride of one character and another. DID I MENTION THERE IS A LOT GOING ON? I enjoyed this novel, for the most part. It was very intelligent in the way that all angles of everything were thought out or developed. The different characters were all very well-rounded and the way they constantly misunderstood one another was hilarious, because the writing is thorough enough that the reader understands everyone but none of the characters understand each other. The strike was the most interesting for me of the many plots going on, because it showed all of the issues at stake so clearly. I REALLY loved Margaret. She’s very conscientious of how she behaves, so often other people don’t understand the amount of FEELS she is having because she’s trying to deal with her problems or not burden other people. This makes her come across as haughty and proud very often, when sometimes she’s just shy or feeling sad and covering it up. But she’s very bold and brave when it matters, and she takes care of her family through some really difficult times. Go Marg. Overall, I recommend it if you are interested in this time period or enjoy complicated romantic dramas. It’s worth the work.